Early Spring inspiration walks in Columbia County, near my home, off Highway 30, north of Portland. On this rocky bluff above St Helens, OR, there is a vernal spring where native wetland and prairie wildflowers bloom in the seeps and fields, in very thin soil. They survive their tiny root zones on top of otherwise solid basalt, by going dormant in summer. Early- to mid-spring is the best time to view the burst of flowers there. 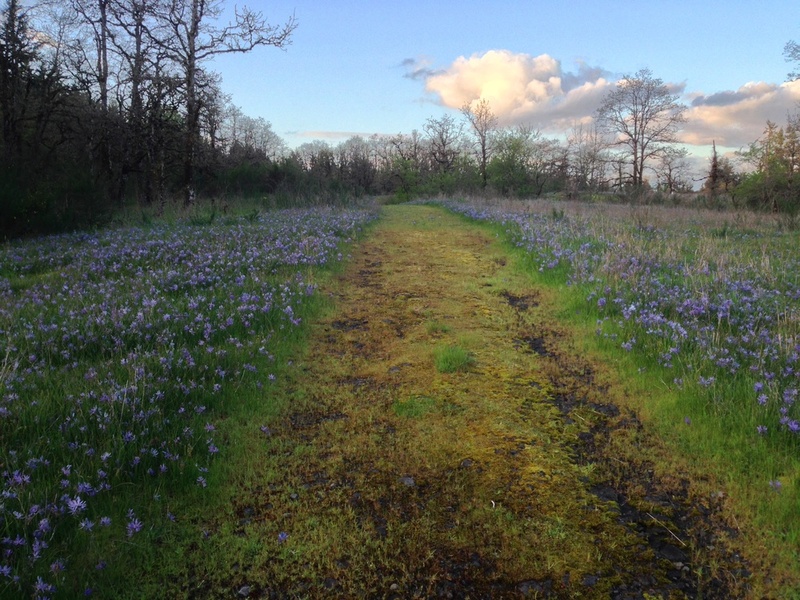 This bluff and informal trail has no name, but I think of it as the Camassia Bluff, for its fields of Camassia quamash (Camas Lily) that bloom in profusion, late April to early May (depending on the year). The trail winds along the upper bluff. It is a road, but I have never seen vehicles on it. The soils are so thin over the basalt ground that it takes very little to create vehicle tracks here, destroying the field plants. Native Oregon white oak prairie wildflowers such as these are now rare in the Willamette Valley. I hope never to see a vehicle here. Thanks for "walking" with me on my first blog post! It all feels quite rough around the edges. I shall endeavor to feature lots of nature and inspirations for gardens in the weeks to come. Photography © Alyse Lansing, 2015. All rights reserved.